Chronic administration of a chimeric FKN-Fc fusion protein exerts durable effects to improve glucose tolerance with increased insulin and decreased glucagon secretion in HFD/obese mice. (A) Intraperitoneal glucose tolerance tests (IPGTTs) in NCD WT mice at day 0. n = 8 for both groups. (B) GTTs in NCD WT mice at day 5. 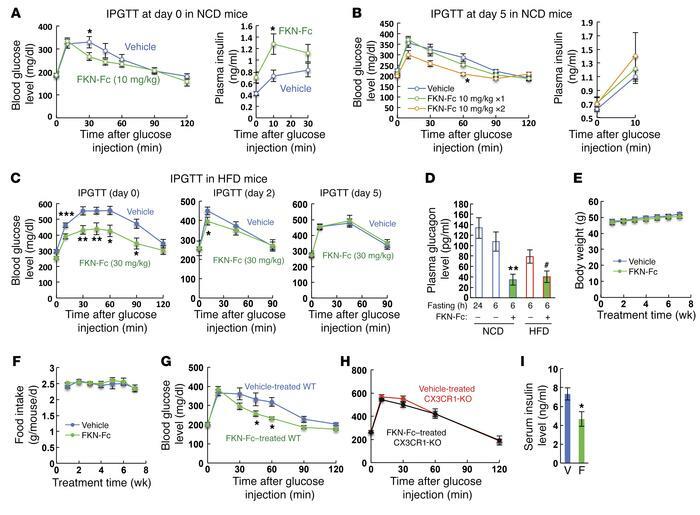 A single injection of 10 mg/kg FKN-Fc or vehicle was given to NCD WT mice at day 0 and, at day 5, glucose tolerance (left) and plasma insulin levels (right) were measured with (FKN-Fc 10 mg/kg ×2) or without (vehicle and FKN-Fc 10 mg/kg ×1) acute FKN-Fc administration. n = 8 for each group. (C) GTTs were performed in HFD WT mice at 0 (left), 2 (middle) or 5 (right panel) days after a single FKN-Fc injection (day 0). n = 8 for both groups. (D) Fasting plasma glucagon levels in NCD and HFD (16 week) WT mice before and 10 min after 30 mg/kg FKN-Fc injection. Mean ± SEM. n = 8 for each group. (E–I) Effects of chronic FKN-Fc administration in HFD mice. Body weight (E; n = 20 WT mice), daily food intake (F; n = 5 WT mice), glucose tolerance (G, n = 8 WT mice; H, n = 8 CX3CR1 KO mice) and serum insulin (I, n = 8 WT mice) levels were measured during or after 8 weeks of FKN-Fc treatment. V, vehicle; F, FKN-Fc. For statistical analysis, 2-way ANOVA with post-hoc t tests between the individual groups (A–C and E–H), 1-way ANOVA (D) or 2-tailed unpaired t test (I) was performed. In all panels, values are mean ± SEM and the symbols indicate statistical analysis: *P < 0.05; **P < 0.01; ***P < 0.001 versus vehicle controls or lane 1; #P < 0.05 versus lane 4. See also Supplemental Figure 1.